The View of Gordon Lake from the deck is incredible and the Sunsets are unforgettable! This beautiful lodge is located within walking distance to the public beach & boat landing, a tennis court, 2 bars and eateries. This roomy ranch-style vacation home has 2 stone fireplaces, a modern kitchen, hardwood floors, picturesque windows, and a large deck overlooking the gorgeous Gordon Lake. 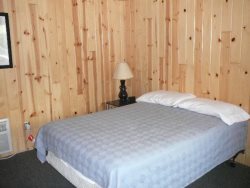 There are 2 bedrooms (one with a king size bed - one with a full size bed) and 2 bathrooms. A couch that folds out to a queen bed will be able to accommodate your extra guests. This lodge can accommodate 6-10 people and comes complete with sheets & blankets. The mini-suite in the walk-out basement has a large window with a wonderful view of the lake, a beautiful stone fireplace, a queen size bed, a fold out couch, and a full bathroom to complete this suite. The location of this cabin has it all... Elk, Deer, and Bear Country... and located on ATV and snowmobile trails near the heart of the Chequamegon National Forest! Towels are not supplied ~ please be sure to bring towels!